As trade and travel continue to increase, more and more people and goods make their way to the United States each year. Unfortunately, not everyone who visits has good intentions, which is why you can earn a good salary working as a U.S. Customs and Border Protection officer. The specialized officers guard ports of entry in and around the United States. A customs agent or officer is responsible for enforcing laws, duties and taxes regarding the import and export of goods, people and materials. Especially since the terror attacks of September 11, 2001, one of the most important roles that U.S. customs officers play is to keep dangerous materials from entering or leaving the United States. 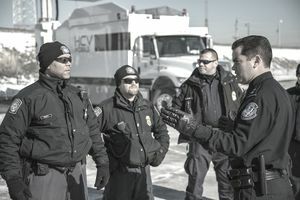 Customs and Border Protection officers are assigned to the Customs and Border Protections Field Operations Division, one of three uniformed divisions within the U.S. Customs and Border Protection agency of the Department of Homeland Security. The other two uniformed divisions are the U.S. Border Patrol and the Customs and Border Protection Air and Marine division. While both customs officers and border patrol agents are focused on keeping national borders safe and secure, customs officers' primary focus is on the import and export of goods and materials as opposed to immigration. Customs officers work at international airports, seaports, and land ports around the United States and at key locations around the world. They inspect cargo, passengers, and luggage to help keep illegal drugs and other contraband from making its way into the U.S. They also enforce laws with regards to the movement of intellectual property and make sure potentially invasive animals and plants are not brought to into the country illegally. Customs officers help ensure the collection of import taxes and duties, which in turn help local commerce and the U.S. economy. Customs officers are hired at either the GS-5 or GS-7 pay grade within the federal government's pay system, depending on experience and education. Starting salary at the GS-5 level is about $32,000 - not including overtime, benefits or federal locality pay - and requires either three years of experience dealing with people or a bachelor's degree. The GS-7 salary starts at about $40,000 before overtime and locality pay and requires any combination of specialized experience, graduate-level education, and superior academic performance. According to the U.S. Federal Government's job site, USAJOBS, to be considered for a job as a customs officer you need to be a United States citizen between the ages of 21 and 37. You must also have been living in the United States for the past 3 years and hold a valid driver license. After you apply for the job, you'll have to go through a thorough background check, a medical screening, and a physical fitness assessment. If you're hired, you'll receive a 30-day orientation training at your home port before going through a 19-week training program at the Federal Law Enforcement Training Center in Glynco, Georgia. A job as a U.S. Customs and Border Protection officer offers a good salary, great federal benefits, and job stability. More importantly, though, working in customs and border protection offers a great opportunity to serve others and help keep your country safe and secure.